When we started the No Spending Challenge for the month of October, part of the process was determining if there were things that would be an exception to the no spending rule. I chose to spend on medical bills, $50 a week on groceries, and Halloween costumes, which I would make as inexpensively as I could since I had already promised the kids they could be certain things & I knew I didn’t have everything I would need for their costumes. A funny thing happened, though, because as the days of no spending went by, I found myself not wanting to spend anything on costumes, even though I had told myself it would be okay. So, I pulled out the costume box from past years and the twins both found something that they LOVED that they could use in the box – score! The other costumes I was able to pull together for only $6 plus tax — not too shabby, right? 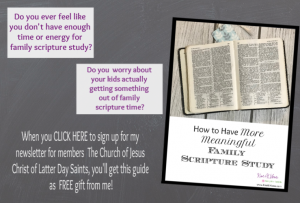 The key is to get creative – dig through closets, check out thrift stores and dollar stores, and see what you can get for free or cheap (I use local facebook groups). Strawberry Shortcake: I had the hardest time coming up with an idea for this little girl’s costume. 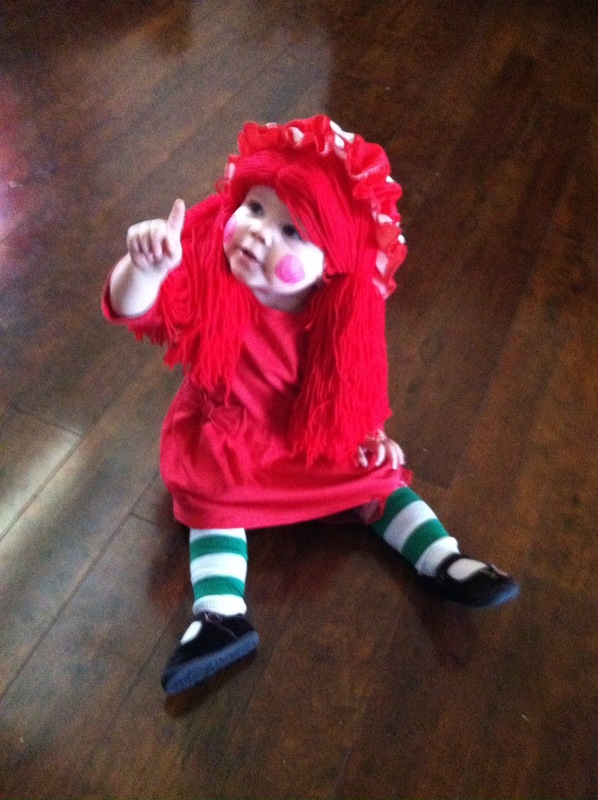 So, I asked the kids what we should do and one of them had the idea of Strawberry Shortcake – of course, that was BEFORE I had decided to try to not spend anything on costumes, so it was amazing how it all came together. We got the cute red dress as a hand me down and it was in the closet with the winter dresses she hadn’t started wearing yet. I belong to a facebook group for our town where people offer free things and one day saw someone was giving away some costumes, including this wig. I was amazed someone hadn’t snatched it up yet and even more amazed that it fit! I spent $1 on a pair of Christmas socks at the dollar store; I just cut off the Christmasy owl on the top and cut off the bottoms to make a pair of green striped “tights” that go on like leg warmers over a pair of white socks and white leggings that we already had. 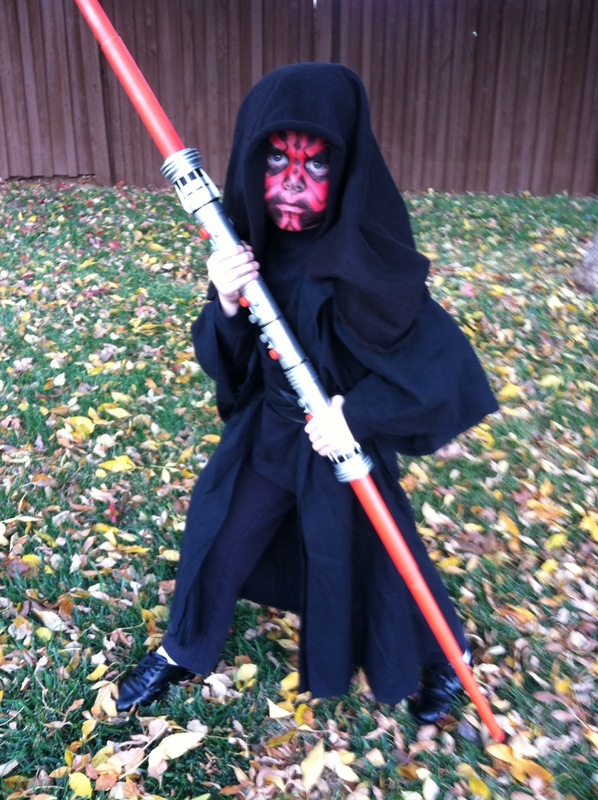 Darth Maul: We had the robe already that I made for last year’s Darth Sidious costume. We also already owned the light saber. We used some leftover fabric to make a belt and spent $3 on face paint. 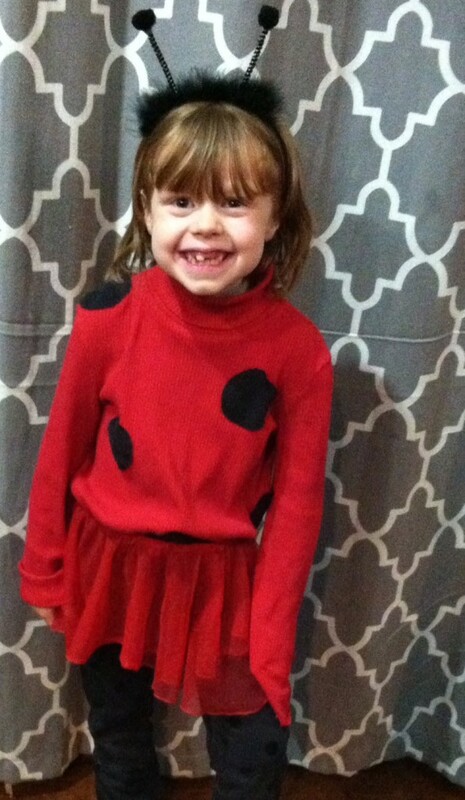 Ladybug: We dug through some hand me downs that she hasn’t grown into yet and found a pair of black pants and a red shirt. The tutu/skirt was in the girls’ dress up box. I cut up an old pair of black shorts into circles and sewed them onto the shirt. We spent $2 on the antennae – I found them at the dollar store but they had skulls on the ends so we took those off and bought black fuzzy balls to glue on the ends instead.